RIGS Mechanized Combat League is PlayStation VR’s first real attempt to make a highly-competitive multiplayer game. Mixing aspects of the best First Person Shooters and the structure of sports, RIGS definitely gives a good first impression. Couple that with depth of the RIGS you control with multiple competitive modes, you’d think this could be something that catches on. The only problem though is that if you want a really competitive game to play online against others, there is a ton of other games out that that aren’t constrained by VR and while RIGS offers enough for you to enjoy, it’s staying power is definitely questioned. 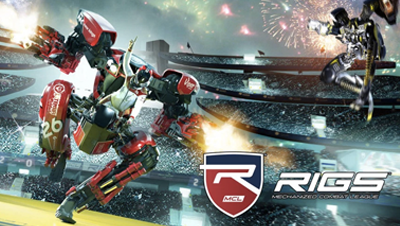 Developed by Guerrilla Cambridge and out now on PlayStation VR, RIGS Mechanized Combat League turns the mech-battling game and turns it into a spectator sport. When you begin the game, the presentation is definitely exciting. The colours, commentary, and structure of the game turns a simplistic enough shooter into a massive sport and it definitely gets you excited about playing. The only problem though is that when you actually get into the play, there is always something to bring down the game’s biggest selling point: The sense of speed. Matches are incredibly quick and short which is great for those that just want to jump in and play for a few minutes. This is good because despite being in a cockpit, the sense of speed and movement can be kinda jarring at times and I’ve had to walk away a match or two early just because I don’t know if my head could have taken more. You can equip different RIGS that bring with it its own benefits and weaknesses. This adds a great dynamic to switch things up to keep things fresh both for you and how you approach the few different modes on offer. You have your standard Team Deathmatch which just doesn’t feel as fun as it is in other games. RIGS has a mode though that truly shines. As the game mentions it is more of a sport than a shooter, the Power Slam Mode was the only real mode worth playing and investing in. In Power Slam mode you can either kill the opposing team or collect orbs that can be found all over the map. This will eventually put you into Overdrive. You must then jump through a massive ring to score. The team with the most scores at the end of the match wins. It’s simple but it’s incredibly fun, fast, and enjoyable. It brings the best elements of the game together into the purest form. Everything else feels like it detracts from the brilliance of playing Power Slam. You can earn upgrades for your RIG which are called sponsorships because of course it is - it’s the future of sport so it takes all the ridiculousness of it into this game. The way you earn sponsorships is by completing challenges which is honestly pretty frustrating as it forces you to play certain ways or obtain goals that are annoying to try complete. RIGS Mechanized Combat League aims to be a proper multiplayer game that’s exclusively played in VR. It's fun for quick-play, offers a decent amount of progression, and looks pretty decent. It has all the hallmarks of the first game of its type from a team of developers as there are enough shortcomings to keep it from being essential. For example: Even though everything is incredibly fast, the intro and ending of every match forces you to watch sequences that keep the flow going and just gets tiresome quite quickly. Bit of a mixed bag here. It’s surprisingly fine giving how fast movement is but it does get to you over time. I couldn’t play this game for more than 30 minutes to an hour at a timer before it started to affect me. It's a multiplayer game that you can’t play for hours like other shooters which keeps it from being in your rotation of a few greats. This game is a great start to the future of competitive VR sports titles.